A review of Transnational Marriage, Gendered Migration and the Wellbeing of Asian Women Migrants: A Mixed-Methods Comparative Study of Taiwan and South Korea, by Hsin-Chieh Chang. In her dissertation, Hsin-Chieh Chang, specializing in Community Health Sciences, examines marriage migrants’ post-migration wellbeing with consideration of various social factors that shape the social integration process. By using both quantitative and qualitative research, Chang investigates how gender dynamics in marital relationships, migrants’ pre-migration socioeconomic status (as well as that of marital families), and social integration (especially relationships with the native population) affect women marriage migrants’ wellbeing. The dissertation consists of six chapters: an introductory chapter, a methodology chapter, three substantive chapters, and a concluding chapter. The introductory chapter provides a literature review on marriage migration and marriage migrants, who have traditionally been viewed in binary terms— as victims or opportunists. Chang recognizes a recent feminist discourse that highlights marriage migrants’ reproductive contribution but challenges the grouping of marriage migrants with domestic migrants as the former have different moral currency, social recognition, and life trajectories from the latter. Chang then provides social contexts of South Korea and Taiwan, the two comparable countries for enduring Confucian traditions of patriarchy and familism (e.g., hypergamous “marrying up” tradition, gendered familial roles), and parallel socioeconomic phenomena in recent decades (e.g., receiving different migrant populations, low fertility rates, increasing women’s status). One of the most significant aspects of Chang’s dissertation is the scope of her qualitative research, which focuses on Vietnamese marriage migrants, one of the largest marriage migrant groups in both countries. In addition to the two receiving countries, Chang visited Vietnam, the sending country. She conducted multi-site fieldwork in these countries: Ho Chi Minh City and the Mekong Delta Region in Vietnam; Seoul, Ansan, Incheon, Suwon, Daejeon and Daegu in South Korea; and Taipei, Bade Taoyuan, Nantou, LiuChia Tainan, Meinung Kaohsiung, Kaohisung City and Ping Tong in Taiwan. Altogether, she interviewed 55 Vietnamese marriage migrants (VMMs), held four focus groups (20 additional VMMs), and visited 16 agencies that serve marriage migrants. For her quantitative analysis, Chang used the “2009 National Survey on Multicultural Families in South Korea” from the Korean Institute of Health and Social Affairs (KIHASA), with a large sample of 73,669 marriage migrants. Using this large dataset, the first two substantive chapters focus on South Korea. In Chapter 3, Chang examines the factors that affect marriage migrants’ self-rated health (dependent variable). Grounded in the social determinants of health (SDH) framework, Chang considers socioeconomic status (SES) as a significant aspect (operationalized as marriage migrants’ husbands’ education, and perceived marital families’ SES). Then, she takes two interesting approaches. First, instead of focusing primarily on the post-migration context, Chang includes pre-migration SES (marriage migrants’ education and perceived SES) to see the correlation between migration process and self-rated health. Second, to measure the impact of social integration of marriage migrants, Chang measures social relationships with co-ethnics and social relationships with native Koreans. Other variables include Korean language fluency, length of stay, and citizenship status. The results of quantitative analysis on three groups of marriage migrants—Korean Chinese, Han Chinese, and Vietnamese—show that post-migration SES is positively related to self-rated health, supporting the existing discourse that higher post-migration social status is associated with good health among migrants. However, pre-migration SES paints a more complex picture. Chang finds that for Han Chinese women, coming from a wealthy family is negatively associated with health, and Vietnamese women with the lowest educational attainment are more likely to report better health, which is noteworthy. Chang argues that the association between high education and worse reports of health are attributed to acculturation stress and ethnic discrimination in the social incorporation process. Also, Chang shows that having social relationships with native Koreans has a significant positive association with health across all three groups (after controlling for perceived discrimination). Only Vietnamese marriage migrants had a significant negative association between more than one type of social interaction with co-ethnics and self-rated health. Chang contends that this points to social isolation among Vietnamese women who are newer immigrants and how this can prevent the women from taking advantage of resources to maintain their health. Chang stresses that the significant association between the longer length of stay and worse health across all groups presents an important policy question. In Chapter 4, Chang turns to the domestic sphere by asking about the relationship between marital power dynamics and the wellbeing of marriage migrants. To do so, Chang applies Hyman Rodman’s “theory of resources in cultural context,” which examines the simultaneous effects of cultural gender ideology and resources (e.g., income and education), to the case of marriage migrants. Her dependent variables that indicate wellbeing outcomes include self-rated health, life satisfaction, and perceived views of marriage migration to Korea. Her independent variables of marital power dynamics are the dyadic differences in age, education, and family social standing (between natal and marital). She also considers marriage migrants’ nationality, social integration, and marital family-level factors (such as co-residence with parents-in-law). The findings support the idea that the patriarchal marriage gradient—women marrying up—is positively associated with better health for women. The analysis showed that the larger gap between husband and wife in education and SES (with the man having a higher status and educational attainment) is positively associated with better health report and life satisfaction. Age was only related to health and, only SES had a correlation with the view of marriage migration. In contrast, the wives’ higher education was associated with a lower view of marriage migration to Korea, supporting Nicole Constable’s idea of the paradox of global hypergamy where women marry up from the developing country to the developed country, yet marry down in terms of the husband’s individual attributes (Cross-Border Marriages: Gender and Mobility in Transnational Asia. Philadelphia: University of Pennsylvania Press, 2004). In Chapter 5, Chang reports her findings from qualitative research in both Taiwan and Korea. Her main goal is to explore the patterns and processes of VMMs’ social integration with consideration of various factors in the migration process, women’s agency, and comparison between Taiwan and Korea. For recruitment, she uses the purposive sampling of three groups: (1) VMMs who worked for civic organizations that support new marriage migrants; (2) VMMs who were not with their husbands due to separation, divorce, or deceased husbands; (3) and VMMs who do not belong to the first two categories. Drawing on the interview data, Chang first proposes a “double transition of marriage migration” framework that explains different experiences among VMMs. She divides VMMs’ pre-migration status into three categories—privileged, constrained, and disadvantaged; and contends that VMMs’ status is related to marriage channels—personal encounter, introduction through social networks, or commercial agencies. Yet, women’s pre-migration experiences also facilitate an unexpected impact on the integration process: for example, a woman from the disadvantaged status has a better integration process due to her pre-migration work experiences. Second, Chang proposes a “two-step social integration model” that suggests that how marriage migrants are integrated into marital families affect how they are integrated into the host society. The interview data shows that VMMs with the marital family’s support could experience successful integration, while those without it had challenges in the integration processes. Also, Chang demonstrates how VMMs who were not accepted by in-laws, and who had few opportunities to establish social relationships with co-ethnics or natives, most need social protection and welfare support. Lastly, Chang compares VMMs’ experiences between Taiwan and South Korea. While the South Korean government’s attitude seems more inclusive with their attention to “multicultural families” than the Taiwan government’s attitude toward “new immigrants,” VMMs in Korea expressed more critical views on their post-migration experiences. Chang explains that this is attributed to the longer history of marriage migration to Taiwan and more conservative gender ideology in South Korea. According to the UN Gender Empowerment Measure and the Global Gender Gap Report, South Korea ranks lower than both Taiwan and Vietnam. This indicates, Chang argues, that VMMs are in fact marrying down by the measure of gender egalitarianism, which negatively affects their social integration processes. In the concluding chapter, Chang stresses that the initial period immediately after migration is critical to marriage migrants’ social integration process. She also calls for educational programs for the husbands and marital families regarding migrants’ human rights and cultural sensitivity. Furthermore, social welfare provisions including health literacy are important, as well as the secure entry into labor markets. University of California, Los Angeles. 2014. 181pp. Primary Advisor: Anne R. Pebley. 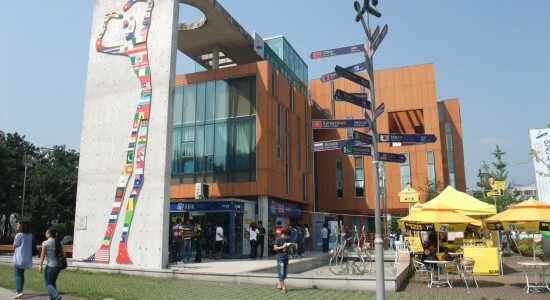 Image: Multicultural Center in Ansan City, South Korea. Photograph by Author.